Saints will be without a host of first-team stars when they head to Saracens for Saturday’s Champions Cup quarter-final (kick-off 5.45pm). Dylan Hartley, Kieran Brookes, Jamie Gibson, Calum Clark, Tom Wood, Sam Dickinson, Jon Fisher, Lee Dickson, George North, Tom Collins and Tom Stephenson all miss the trip to Allianz Park. 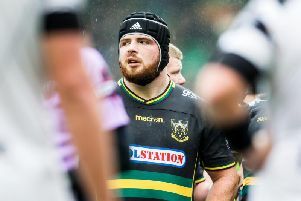 That means men such as Paul Hill, James Craig, Jamie Elliott and Ben Nutley, who will be making his first first-team appearance this season, are thrust into the European spotlight this weekend. One piece of good news for Saints is that Luther Burrell returns after suffering a head injury in the win against Harlequins on March 27. Burrell lines up alongside George Pisi at centre, with Harry Mallinder on the bench. Ben Foden will skipper Saints in the absence of club captain Dickson and England duo Hartley and Wood. Meanwhile, Saracens have no such injury issues, with the Aviva Premiership table-toppers able to select a formidable side. Maro Itoje has recovered from a knee injury to take his place in the second row, alongside fellow England lock George Kruis. Former Saints wing Chris Ashton starts in a backline that also includes the likes of Owen Farrell and Alex Goode. Saracens: Goode; Ashton, Taylor, Barritt (c), Wyles; Farrell, Wigglesworth; M Vunipola, Brits, Du Plessis; Itoje, Kruis; Wray, Fraser, B Vunipola. Replacements: Saunders, Barrington, Lamositele, Hargreaves, Rhodes, De Kock, Bosch, Ransom. Saints: Foden (c); K Pisi, G Pisi, Burrell, Elliott; Myler, Fotuali’i; A Waller, Haywood, Hill; Craig, Day; Lawes, Nutley, Harrison. Replacements: Marshall, Ma’afu, Denman, Matfield, Paterson, Kessell, Hanrahan, Mallinder.